JP 2012-03-14 ¥286 (300) ? 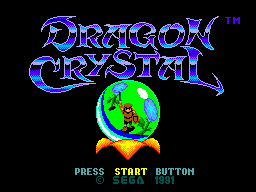 Dragon Crystal, known as Dragon Crystal: Tsurani no Meikyu (ドラゴンクリスタル ―ツラニの迷宮―) in Japan, is a Sega Master System and Sega Game Gear roguelike. The gameplay and much of the graphics are shared with Fatal Labyrinth. Main article: Dragon Crystal/Magazine articles.